1.- What is an Implant? 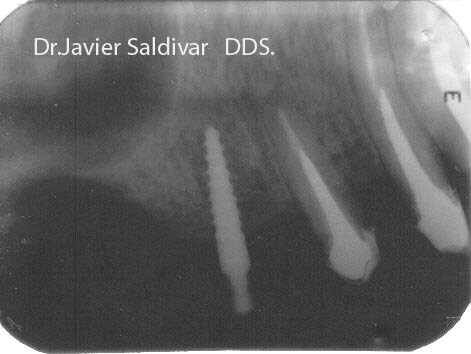 2.- Am I A Candidate For Dental Implants? 3.- How Are Implants Placed? 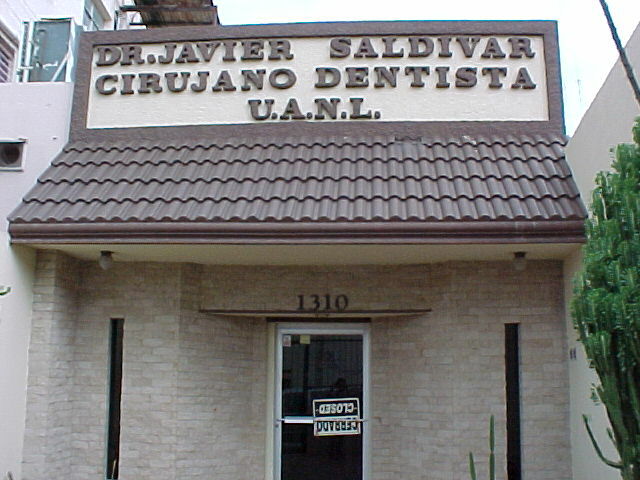 Copyright © 2004 Dr.Javier Saldivar V. All Rights Reserved. The term implant refers to a medical device that replaces a missing body part. Implants, as the name implies, are placed or implanted inside the body and function much like the missing body part that it is replacing. Medical technology has advanced to the point where implants are commonly used to improve not only the physical well-being but also the quality of life of a vast number of patients. A good example of this is the use of an artificial hip joint to replace a painful, worn-out arthritic hip. Typically implants are constructed from materials that are biocompatible. Biocompatible materials are not recognized by the body as foreign and therefore the body does not reject them. The term dental implant refers to a dental device that is used to replace the root portion of a missing tooth or teeth. These artificial root replacements can then be used to support natural looking teeth that enable patients who are missing some or all of their natural teeth to smile and speak with confidence and to chew their food well and more comfortably. Dental implants come in a variety designs, however, the most common type of implants are threaded titanium cylinders that are placed into the jaw bones (Figure 1). Titanium is one of the biocompatible materials that is not recognized by the body's immune system and, therefore, allows dental implants to be placed without undergoing rejection. Copyright © 2015 Dr.Javier Saldivar V. All Rights Reserved. Simply put, any person who has had the misfortune to lose one or more teeth, or even a part of the jaw bone, is a candidate for dental implants. This includes those individuals who have congenitally missing teeth (i.e., some or all or their teeth have been missing since birth). As an aside, if you fall into any of these categories you are not alone as it has been estimated that approximately 125 million Americans are missing one or more teeth for one reason or another! Once we have established the absence of one or more teeth, as the basic criteria for placing dental implants, we must consider two additional factors that may ultimately affect the outcome of treatment. Firstly, patients need to be in a good state of health and we would expect that any systemic illnesses or condition that may adversely affect healing is well under control. The diabetic patient, as an example, may be an acceptable candidate for dental implants provided that their disease process has been addressed and they are carefully monitoring their medications and level of blood sugar. If this is not the case and the patient is unstable, then we would need to work with the patient's physician to correct the situation prior to proceeding with treatment. Any concerns that you may have regarding your medical history should be discussed with your doctor at a consultation appointment. Secondly, the patient must have enough high quality bone within which the implant(s) can be placed. Whenever a tooth is lost, bone in the surrounding area begins to remodel and slowly disappears. This physiological process is called resorption. Consequently, patients who have been missing teeth for a period of time may also present with resorption of the jaw bones. If the degree of resorption is slight then it is usually possible to place dental implants without any further treatment. However, if the resorption process is extensive there may be insufficient bone available to support the implant. In the not too distant past patients who presented with insufficient bone were simply classified as non-candidates, and were left untreated. Fortunately we are now able to transform the majority of non-candidate patients, with deficient bony support in either the upper or lower jaw, into good candidates for dental implants with the use of a variety of simple grafting procedures. Often the grafting can be done in conjunction with the placement of implants in a single surgical procedure. This minimizes patient inconvenience and decreases the treatment time. Some patient's present with more significant bone loss and may require more extensive grafting procedures that need to be accomplished prior to the placement of implants. In any case, it is important to remember that almost any patient can receive dental implants as long as they are committed to treatment. Again, your doctor should discuss the necessity of any grafting procedures at the consultation appointment. Implantology is the branch of dentistry which deals with implantation; in other words, the placement of mainly metallic parts (titanium screws) into the jaw bone. The Branemark System was developed in Sweden by a research team led by Prof. P.I. Branemark. He discovered that, when implants made of pure titanium and of a cylindrical design were placed in bone using a controlled surgical technique, the bone would then grow directly onto the surface of the implant. This created a lasting biological bond which is termed osseointegration. From these original observations and many years of development, experiment and clinical trials have led to the proven technical techniques available to patients today. A dental implant is a small titanium fixture that serves as the replacement for the root of a missing natural tooth. The implant is placed in the upper or lower jaw. It will bond with the bone over time and thus serve as an anchor for the replacement tooth. Dental implants can be used to replace a single lost tooth or many missing teeth. Occasionally, older patients express concern that their age may prevent them from enjoying the benefits of dental implants. However, health is more of a determining factor than age. If you're healthy enough to have a tooth extracted, you're probably healthy enough to receive dental implants. Certain chronic diseases may contraindicate implant treatment. Your dentist will determine if you are a candidate for dental implants after a careful evaluation of your dental and health history. What are the advantages of dental implants over dentures or a bridge/crown? 1· Improved appearance: When you lose entire tooth – crown and root – shrinkage of the jawbone may cause your face to look older. Dental implants can stop this process. A traditional denture or bridge doesn’t. 2· Maintained natural teeth: With traditional practices, two teeth adjacent to a missing tooth must be ground down to anchor a bridge. Dental implants often eliminate the need to modify healthy teeth. 3· Permanent solution: There are no loose parts to worry about. The implant is stable and comfortable. No adjustment is needed after installation. Normally, it will serve its owner for life. Today, there is an alternative to the two-step method that allows you to have the implant installed in one whole piece in one single session. This new method has simplified the procedure a lot, both for patients and dentists.This method is called: " Immediate Loading of Dental Implants"
The procedure which is chosen depends on several factors, such as the patient’s dental health, the number of teeth involved and which teeth are replaced. These factors will also determine the total number of visits to the dentist throughout the treatment period. Immediate loading implants are the implants that are loaded within 15 days of the insertion. Clinical and radiographical diagnosis and therapy planning. Impressions for the production of the temporary teeth which will be used for the 3 first days after the insertion of the implants. Surgery for insertion of the implants in position (when possible flapless). If teeth or remaining roots are to be removed they will be removed in this session. - Impression of the inserted implants. - Temporary teeth will be fixed in the patients' mouth for the next 3 days. Final impressions for the production of the final ceramic bridge. Final ceramic teeth will be evaluated. Cementation of the final ceramic teeth. Just as with any surgery, there can be some discomfort. Anesthesia and patient sedation are used to eliminate any discomfort at the time of the procedure. Most patients report that they were much more comfortable following the procedure than they had anticipated. Your doctor will prescribe medications to ease any discomfort that may occur. Ask us to recommend another patient who has already had tooth replacement therapy to assess their personal experience. How quick is the surgery? The surgery is a quick procedure. Our Specialists need about 30 min for the painfree placement of 2 implants. What is the Flapless method and how is it done? It is normal to have some small bruises and swelling in the gum and soft tissues. But usually the discomfort, if any, is treated with an ordinary painkiller. You should expect to be able to work the next day. Expect the discomfort to go away after the second day from the surgery. What kinds of implants will be used ? There are many different companies which produce implants nowadays. The implants we use are the Nobel Biocare of Branemark system. Nobel Biocare has been the innovative leader in the dental industry for 50 years. The solutions and products are at the very forefront, providing both dentist and patient with efficient treatment procedures, excellent function and high esthetic outcome. Nobel Biocare gives a 10-year-guarantee for every inserted implant and it will be given to every patient of our clininc. The fee for tooth replacement with dental implants will depend on several factors, including the number of teeth being replaced and the number of implants required to support your replacement teeth. Some additional procedures may be required prior to the placement of your dental implants to ensure the long-term health of your dental implants. Typically, there is a fee for the surgical procedure and a separate fee for attaching the posts and constructing your replacement teeth. To obtain a specific fee estimate, it is necessary to have our doctor recommend the treatment that is best for you. How Are Implants Placed? The Case Finish. 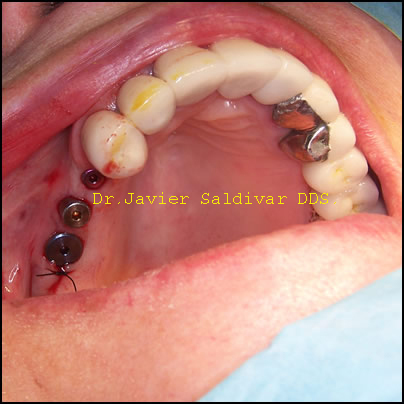 Copyright © 2013 Dr.Javier Saldivar V. All Rights Reserved. The actual process of placing the implant into the jaw involves two straightforward surgical procedures. These procedures are so simple that they are usually performed in the office with local anesthesia (Novocain or Lidocaine). The first procedure involves creating a precision channel in the jawbone into which the implant is firmly threaded. 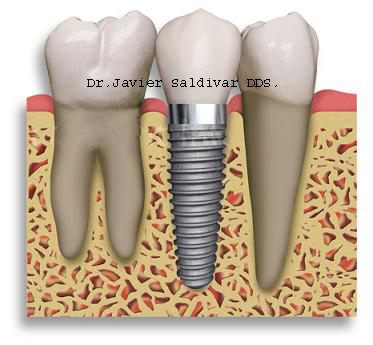 The implant then remains undisturbed for a period of four to six months. During this initial healing phase the surrounding bone heals tightly to the implant's surface giving it firm support. This healing process is termed osseointegration, which literally means bone connection. 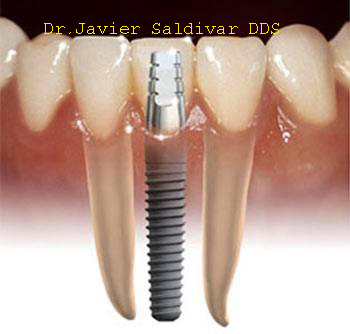 The implant usually remains covered over during this phase and the patient is unaware of its presence. You can wear your existing denture or a temporary crown or bridge may be worn over the area while healing takes place. Once the implant is firmly attached to the bone it can be uncovered during the second surgical procedure. The surgeon or restorative dentist will then select and place an abutment onto which teeth can be attached (Figure 2). At this point, the restorative dentist will fabricate the appropriate crown, bridge or denture type restoration. There are other special circumstances that also bear mentioning. For example, in some cases, an implant can be placed immediately into a tooth extraction site. The tooth site must be free from active infection and sufficient bone must be present to allow for initial stabilization of the implant. Here the advantage is that the overall treatment time is minimized. In most cases, however, the extraction socket needs to heal (2-3 months) before implants are placed. Dr.Saldivar will discuss this timing with you if you are a candidate. Additionally, for those individuals who are very anxious or for those patient's where a lengthy procedure is anticipated, sedation is available and encouraged. With all the recent advances in dental implantology patients should expect their implants to remain in function for many years. The individual success rates for an implant is determined in part by a number of patient factors that may include the amount and quality of the existing bone when the implant was placed, the type of restoration and the patientís hygiene or maintenance program, to name a few. Although implants are made of metal they are not bulletproof and occasionally a problem may arise. Unlike natural teeth, however, if a dental implant needs to be removed it can usually be replaced once the bone in the area has healed. Once again implants have proven to be a reliable treatment alternative for patients with missing teeth with the ability to significantly improve the patientís the quality of life while restoring their physical well being. If you have further questions regarding this condition, wish to consult further with us or are in need of a second opinion, please do not hesitate to visit our consultation services section at the Center for Reconstructive Jaw Surgery. 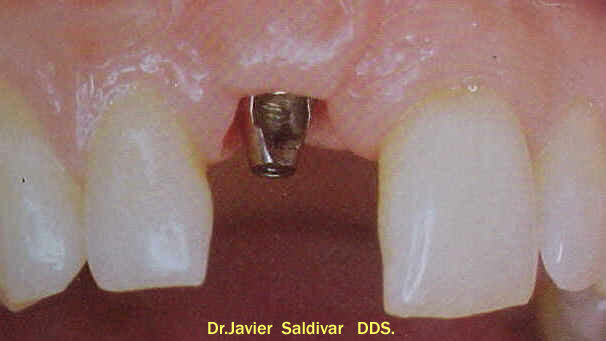 The MDI System consists of a miniature titanium implant that acts like the root of your tooth and a retaining fixture that is incorporated into the base of your denture, The head of the implant is shaped like a ball and the retaining fixture acts like a socket that contains a rubber O-ring. The O-ring snaps over the ball when the denture is seated and holds the denture at a predetermined leve of force. When seated, the denture gently rests on the gum tissue. The implant fixtures allow for micro-mobility while withstanding natural lifting forces. Is the Mini Implant FDA approved? Yes. Prior to his preliminary discussions with Dr. Bulard, Dr. Sendax had submitted a formal application to the FDA in Washington, DC seeking permission to market the mini dental implant devices to the general public. After providing satisfactory technical and clinical evidence to that agency that the product was safe for public use and in fact had beneficial attributes, the FDA granted its formal consent to market the Mini Dental Implant device not only as a transitional or temporary dental product, but significantly, as a long-term item. ( IMTEC was the first company to receive long-term approval of its MDI implants from the FDA, and for several years, was the only company to have that distinction.) 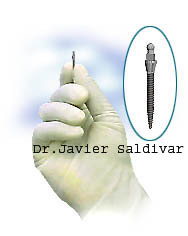 As stated, IMTEC's introduction of the Mini Dental Implant to the dental industry and appropriate marketing efforts under a license granted by Dr. Sendax followed the FDA's consent to market. When can Mini Implants be used? When critically needed for support purposes, and where solid bony adaptation (integration) has clearly occurred, mini implants can function as long-term supporting structures rather than as short-term or medium term devices. In fact, some have been successfully functioning in patients' jaws for several decades. In the past several years, some clinicians have been utilizing MDI's for single tooth replacements and in crown and bridge cases..
What's the primary and most effective use for Mini Implants? How specifically can Mini Implants help denture wearers? The standard insertion protocol for mini dental implants calls for four of them to be gently screwed into the front of a patient's lower jaw. This is a relatively painless procedure that can be performed by a general dentist, requiring only a mild anesthesia. The mini dental implants, which are approximately the size of wooden toothpicks, are placed about five millimeters apart in the patient's mandible. The patient's denture is then carefully adjusted by the dentist to allow it to snap onto the four mini implants. The result? A tight fitting, completely reliable system that allows a patient to speak and eat with confidence. 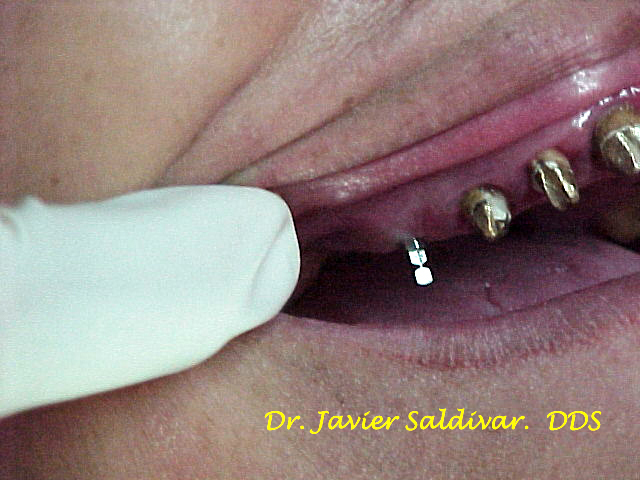 The Mini Dental Implants are placed in about an hour's time. Because of the unique, minimally invasive procedure, the minute size of the implants, and the characteristic placement area, the typical Mini Dental Implant patient can enjoy a light meal an hour or so after having the mini implants placed. Further,a denture patient who has had his or her prosthesis stabilized with MDI can remove and replae the denture easily after a little practice, and can easily utilize good dental hygiene. All in all, the MDI is quite satisfying. La solución total para su dentadura. Hoy con los nuevos avances de la ciencia y la tecnología, tengo la grata experiencia clínica de lograr que los pacientes de la tercera edad, que presenten la perdida total o parcial de su dentadura, recuperen la alegría, el buen humor y la satisfacción de masticar o hablar cómodamente, sin ninguna limitación. Además con los MINI IMPLANTES DENTALES se puede fijar dentaduras totales,evitando que los pacientes sufran heridas en sus encías, y las molestias de no poder morder, hablar, reír, etc. Es una cirugía muy simple que hasta con anestesia local la podemos realizar; es su decisión. Los implantes dentales son pequeños dispositivos metálicos de TITANIO, en forma de tornillos, que se colocan en el hueso de ambos maxilares, los cuales se van a consolidar en el hueso, procediendo inmediatamente a confeccionar la prótesis requerida. Los pacientes que han seleccionado este método informan, que se sienten contentos por primera vez desde que perdieron sus dientes. Cualquier persona (entre 18 y 75 años), a quién le falten uno o más dientes es candidato para el implante dental. ¿Tiene Usted Problemas con su Dentadura ?. En hora y media puede tener su dentadura firme y sin movilidad. Con este sistema de MINI IMPLANTES, le puedo solucionar su problema. Una Sesión - Maxilar Superior e Inferior. align="center">Si desea mayor información, mande su e-mail o haga su cita hoy mismo. Simplemente solicite una cita y gustosamente lo examinaré, sin compromiso. Recomendándole el tratamiento más adecuado a sus necesidades. Qué son los implantes dentales? 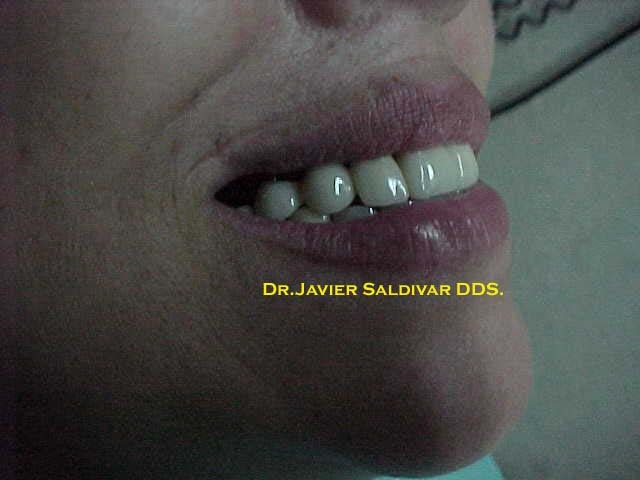 Copyright © 2013 Dr.Javier Saldivar V. All Rights Reserved. Son sustitutos artificiales de las raíces de los dientes naturales. Son pequeños tornillos cilíndricos que se colocan en los maxilares. Los dientes que se reemplazan son adheridos a la parte del implante que sobresale de la encía. Qué hacen los implantes dentales? Pueden reemplazar a los dientes que no se renuevan. Pueden servir de apoyo a una dentadura completa, haciéndola más segura y confortable. Pueden sostener un puente fijo, eliminando 2 problemas: no usar dentadura removible y/o no tallar dientes vecinos. Pueden ayudar en el reemplazo de un solo diente, sin alterar los vecinos. Podré beneficiarme con un implante dental? A pesar que todos los implantes dentales hayan brindado confort y aportado confianza a los pacientes para sonreír, comer, hablar, etc., no son para todos. El paciente ideal debe tener un buen estado de salud y hueso adecuado en principio, para poder soportar el implante. 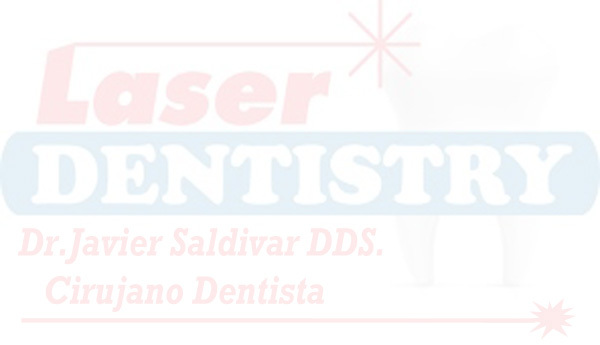 Igualmente es importante para el paciente el compromiso a una higiene oral muy buena y a una visita periódica al dentista de cada 6 meses. Su dentista , periodoncista o protesista puede ayudarlo a decidir si el implante dental es bueno para usted. Para tal decisión es necesario un examen bucal a fondo, se hará una historia clínica personal, con un examen profundo del hueso remanente, controlando la oclusión, radiografías, modelos de su boca para su estudio y planeo de posible tratamiento. 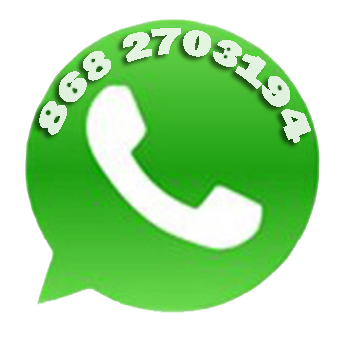 Usted debe esclarecerse, preguntar, informarse de los beneficios, riesgos y posibles alternativas. Los implantes dentales pueden reemplazar los dientes en la misma forma que lo hacen las raíces con los dientes naturales. Los implantes son una alternativa para las dentaduras que se "mueven" o causan dolor. También pueden prevenir situaciones incómodas por falta de algunas piezas dentarias. Los implantes con un cuidado oral adecuado y visitas periódicas a su dentista pueden durar muchos años .Ya hay implantes que están puestos en boca por más de 20 años y pueden durar toda una vida. El implante dental requiere una inversión de dinero mayor que una dentadura removible o un puente fijo convencional. Además requiere una inversión de tiempo que puede llevar de 3 a 9 meses desde que se inicia el tratamiento hasta que se finaliza. Si usted considera el tiempo que puede durar un implante, la inversión en tiempo es razonable. Como cualquier procedimiento de cirugía, los implantes dentales encierran riesgos de infección. Ocasionalmente se puede perder alguno y necesite ser reemplazado. El tratamiento puede variar dependiendo del tipo de implante y de la salud del paciente. Por ejemplo, muchos pacientes pueden hacer el tratamiento de implantes en un consultorio odontológico común; otros pueden necesitar un quirófano; la mayoría pueden realizarse con anestesia local y otras intervenciones pueden realizarse con anestesia general para mayor confort del paciente. El primer paso es la instalación de los implantes dentarios en el maxilar. El segundo paso, luego de una espera de 3 a 4 meses, se colocan unos intermediarios a través de la encía, que son los que sostendrán la futura prótesis. El tercer y último paso es la colocación del sistema protésico elegido, sobre los intermediarios colocados en el segundo paso, en forma firme y precisa. Después de finalizado el tratamiento, usted deberá tener una higiene dental adecuada, cepillarlos muy bien, usar hilo dental, control de placa bacteriana y visitas periódicas al dentista son necesarias, para el éxito de los implantes dentales. Quién realiza el tratamiento de implantes dentales? Los tratamientos de implantes dentales requieren conocimientos especiales, entrenamiento, equipo técnico y experiencia, por eso cualquier odontólogo no puede brindar el servicio. Sin embargo, el trabajo en conjunto de los especialistas con los periodoncistas y protesistas es lo mas ideal. Si usted quiere descubrir si los implantes dentales le pueden dar el confort y la confianza que usted necesita, consulte a su dentista , por que él podrá ayudarlo a decidir si el implante dental es apropiado para usted. La Implantología Dental se desarrolló hace 30 años. Existe, por tanto, una gran experiencia sobre las técnicas y los materiales aplicados. Solo después de un examen, el profesional implantólogo podrá determinar si el tratamiento implantológico podrá realizarse. La Implantología Dental permite resolver casos de dientes unitarios sin necesidad de confeccionar un puente. También se resuelven los casos de las prótesis completas (Dentaduras totales o parciales) que se mueven, al permitirnos crear una fijación eficaz. Un implante es de fácil colocación. Requiere una intervención quirúrgica sencilla, que le permitirá, al cabo de pocos meses, disfrutar de las ventajas de la implantología. La implantología resuelve satisfactoriamente muchos casos. Ya terminado su caso deberá visitar a su dentista cada 6 meses. Copyright © 2016 Dr.Javier Saldivar V. All Rights Reserved.